Youth will be the keynote of this footrace. Already we have been contacted by a number of teachers who would like their students to follow the race on a regular basis during the coming school year. We are also privileged partners in the Seine Maritime Department of two groupings of municipalities: the districts of Goderville and Le Havre. Because of this, the students of middle school classes 1 & 2 will be able to see Serge when he comes through, run and talk with him and follow him on his Internet site. When he returns they will meet with him and be able to ask all the questions that have come up during the 12 months of the race and their discovery of the European Union. Last Tuesday we spent a half day with two classes in the Jean Renoir secondary school in Bourges (photo attached). In May, quite by accident, we met the school’s principal, Mr. Alain Payen. Since then we have been working on the idea of making the race an educational tool. On Tuesday after meeting the children, running with them and explaining what this adventure is about, we met the group of teachers in charge of the project as well as the children’s parents: the project was launched. Most probably these 53 students will be able to meet us in Poland. On top of this trip, the students will be able to interact daily with Serge and the teachers will be able to use this interactive tool to work on their subjects. This is especially pertinent because the European Union is part of this year’s program for the class. It’s a project for which enthusiasm promises to grow with each kilometer run. 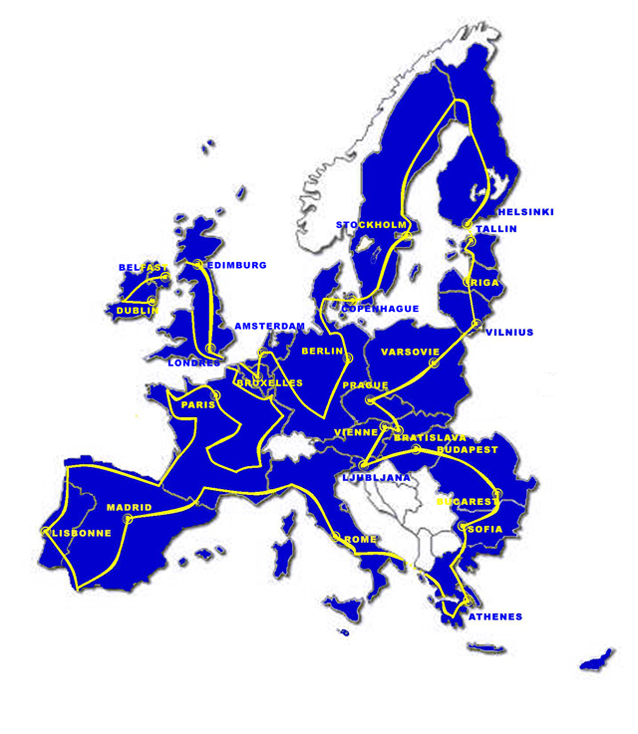 The around the European Union Footrace will start on Saturday, October 17, 2009 at the Charléty stadium in Paris. The official start will be at 11:00 AM in the presence of the event's 3 partners: the Union Financière de France, the Centre des Jeunes Dirigeants and the sporting goods supplier Mizuno. 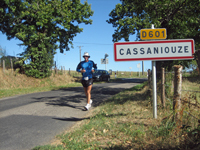 You can join Serge and run the entire distance to Pontoise and why not make it your first long endurance run. You can also join Serge for a part of this route. For those of you who don't dare, we estimate the average speed will be 9 km per hour. Put on your running shoes and become one of the actors in the event. Approaching Sète the traffic gets heavy, runners and followers have to be focused and vigilant. Le Mont Saint Clair gets closer in spite of Hellish traffic. Till the very last minute we are stressed by the road and by guiding Serge. He has to go over locks and small bridges and the last kilometer is run slowly. Barriers are installed because fireworks are planned. Laure tells us that it is for the famous feast of Saint Louis. At the final kilometers of the race Serge is met by the organizers, which makes navigation easier but with the camper in the crowd we are afraid we will arrive after him and miss the moment of his arrival. What a relief! 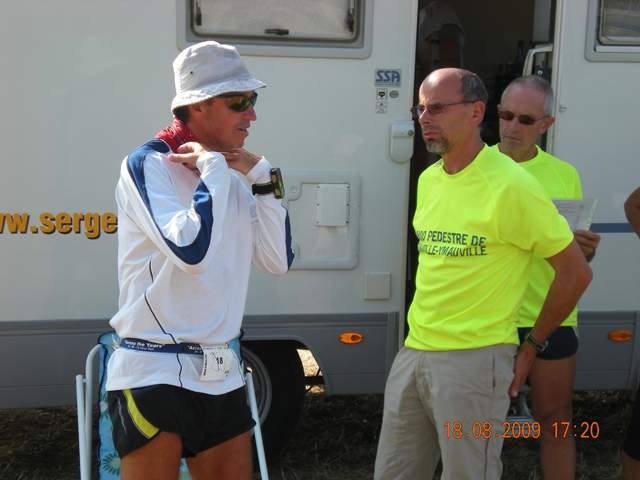 We are at the finish line and Serge follows on our heels: 9 days 12 hours 22 minutes. click to enlarge It’s tough when the alarm goes off at 5:30 a.m. I quickly assemble my gear and my ideas to get breakfast: 10 minutes to prepare, 10 minutes to eat, 10 minutes to get ready to leave and at 6:00 a.m. the caravan creaks into the night. René and I have to leave at the same time as Serge so we can guide him through intersections, not because the sign posting is defective but because it’s not easy to see with only a small headlamp. We don’t want to lose Serge because he wouldn’t like it. This stage will be difficult not because of the heat but because of the terrain. Serge starts with a long descent before attacking the ascent to reach the Col de Vernhette (1029 meters). He reaches the col at noon, exhausted but smiling and relaxed. Perhaps he is suddenly becoming reasonable! He decides to take a break for lunch and as soon as we finish he rests for 30 minutes. At 1:00 p.m. when we start the sky is slightly overcast and most important, the wind has fallen. This morning during the ascent he was running into the wind. But his suffering is not over. There is a 10 km descent to Saint-Rome de Tarn…If ascents are tiring and cause exhaustion; descents put the quadriceps to a rude test. At Saint Rome de Tarn, his thighs are on fire. At Roquefort sur Saulzon the road climbs again. The whole day will be a succession of hills and dales which will give leg muscles a really bad time. At this point Serge has run out of energy, he is wiped out and staggers. I don’t know what enables him to go on. It takes great psychological stamina not to stop at the roadside. We ask ourselves the following question: if his lack of energy is such that an hour or two of rest won’t recharge his batters, what next? He drags himself along for an hour and suddenly minute after minute his stride is firmer, he increases speed and most of all, he is standing straighter. When Serge is tired, he breaks in half and leans forward as if he is going to fall over. It’s quite amazing but the machine is running again. He clocks 900 km at 10:56 p.m., 8 days 14 hours and 56 minutes from the start. We take a picture to immortalize the moment but he is already off; he doesn’t want to get to bed too late and a storm is brewing. The long stage, 92.8 km, ends at kilometer 906, 3 km from the village of “Le Clapier.” There were 1000 meters of positive ascent and 1000 meters of negative descent. certainly Laure's arrival. We are going to beg her to stay until we reach Sète. shame because 3 people and 2 vehicles made for more comfort and less stress. going down, which helps matters. everything in a minimum of time because it's a race against distance and time. click to enlarge Serge has slept badly, he hurts all over and it has upset his sleep. It’s damaging. After 6 days of a race, there are two important factors one must not neglect: food and rest. He leaves camp at 6:30 a.m. He looks like he is using a walker as opposed to starting off to run 100 km. This impression does not last because after five minutes Serge is jogging and off he goes in the chilly morning air; 13°C. In spite of his discomfort and the relief, he moves ahead at a good pace and is enjoying the scenery. It would be too bad not to enjoy all the beauty that nature offers. We cross the market of Mauriac where we have to weave in and out of the crowd and zigzag between the stalls of strawberries that give off their heady scent. During our lunch break at Anglars de Salers we are surprised to see Laure who comes to join us for the weekend. A bit of comfort and support will do Serge no harm. A good meal and a half hour nap and he leaves us to take the road to Salers: a pretty and very touristic hilltop village with narrow streets which don’t make an easy job for René who is at the wheel of the camper. Even though we are in a region of AOC (controlled designation of origin) cheese, we don’t take time to buy any. Days are long and exhausting for the runner and for the followers, whose faces show signs of fatigue. Serge appears to be in good shape and is holding up well but today I upset a well oiled organization. I accompany Serge on the climb to the Col de Legal in order to talk to him about the past week. We reach the col at 6:40 p.m. after 2 hours of walking. We stop at a café-pancake house “Croix de Chelles” at km 793.5 at 8:30 p.m. Serge is not happy with my choice but Joël and René feast on tripe, stuffed cabbage, waffles and pancakes for desert. He goes to bed grumbling while we drink a nice cold beer: a bit of sweetness in a world of brutes. The team says the scenery is sumptuous and we are all subjugated by the Cantal region, even Serge, who is not indifferent to his environment. As we near Aurillac fireworks and background noise leads us to believe that the town is seething with excitement. We decide to accompany Serge on bicycle through Aurillac. The atmosphere is very noisy and festive as we cross the town. The reason is the Street Theater Festival which seemed more like a battle field with hundreds of broken bottles littering the streets and young drunks who can hardly stand and are drinking hard liquor straight out of the bottle. There are thousands of people in the streets at this late hour and the atmosphere is not very reassuring. There is lots of security but we see signs things getting out of control. The center of town is inaccessible to vehicles so bicycle is the only alternative. We reach peace and quiet while Joël and René circle the town. Things would not be normal without some problem at the end of the stage. We can’t find the camper. All the roads seem to lead to D920 which we are careful to follow, so Serge continues to walk while I wait for the guys and the camper at the parking area where we plan to set up camp. We pick up Serge and return to the parking area. It’s 2:05 a.m. and Serge has run 99.5, if not to say 100 km. Let’s hope the night will be sweet. 719.5 km have been clocked. The small error at the end of the stage yesterday upset Serge. In a foot race an error of 3 km is psychologically enormous. Serge was completely closed within himself.As to the race, the temperature is ideal, not too hot, no wind, the scenery is sumptuous. Feedings at the edge of a lake remind us of vacations. The only shadow in the picture is the geography. There is a 440 meters ascent over 50 km. This type of relief at this stage of the race is very bad on the legs and breaks the pace. At 12:30 lunch break – the 40 km objective per half day is met. After eating the traditional plate lunch, he takes a 25 minute nap before starting again? The afternoon goes without a hitch, the pace is maintained, Serge’s concentration is good, and he’s in his race. He gets tired around 7:00 p.m. It seems natural to stop to eat while he not in top form. Panic, nothing is ready but the team has more than one surprise up its sleeve and in 10 minutes everyone sits down to eat. Serge takes the time to eat and to rest for half an hour before running the last 30 km. At this point we need to fill up our water tank. At Meymac I look everywhere but can’t find a fountain. I pass a woman and ask her where I can get water. She says “at my place, 500 m from here. Here are my keys, go into the garage, help yourself and bring me back the keys;” What trust!! 600 km are clocked at 9:32 p.m. We drive on into the night until 1:30 a.m. to set up camp in Neuvic, after clocking 102 km for the day. click to enlarge Last night was not restorative. Serge slept badly, his knee hurts. He has isolated himself and is not sharing much. The machine is slightly dented. He is running at 6 km/hour, which is not the rhythm we are used to, especially at the beginning of a stage. 24 km after the start he asks to rest, he sleeps for 35 minutes. Generally speaking, Serge sleeps a lot and he needs a lot of sleep to recuperate. 4 short nights in a row are beginning to take their toll. To make up time he doesn’t take a break at noon but his average speed drops to 5 km/hour. It’s the limit Serge has allowed himself to slow his progression and take a break because running at this pace saps the morale. He’s sleepy again and can’t run. We suggest a 3 or 4 hour break but at first he refuses -- he wants at all cost to continue and to hold to his objective of 100 km no matter what the price. At Saint Priest la Feuille, he accepts our offer and we find a shady spot where the whole team can rest and sleep for 2 hours. This short break is beneficial - he takes off and his speed tells us that he is much better. As we approach de Mourious we clock 500 km after 4 days 13 hours and 4 minutes. At this precise place the team is separated because of a detour for all the vehicles: René takes the camper to meet us beyond the 500 km mark. For this portion of the route I run with Serge, which enables me to take the excellent photo which is attached. From here on we are closer to the Mediterranean than to the Channel. Serge decides to stop at Bourganeuf. Due to our lack of concentration, we stop Serge 3 km short, at Masbaraud Merignat at Km 518. He has run 86 km. This was a day when we didn’t enjoy the sweetness of Anjou and it was not because of a late start. As usual, Serge took off at 6:20 a.m. He left the camp we had improvised due to the late hour at which we stopped yesterday. Stride upon stride, tirelessly Serge goes on. 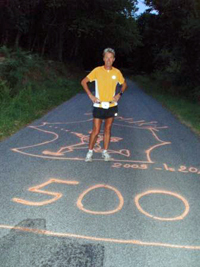 400 km are clocked at the end of the afternoon, just before 6:00 p.m., in exactly 3 days 9 hours 59 minutes and 30 seconds. He arrives for dinner exhausted, he can no longer stand the sun. He takes a 90 minute break. He eats, then sleeps for 45 minutes. At 9:00 p.m. He takes off again. We decide to accompany him because in his weakened physical condition and due to fatigue it does not seem wise to let him go out on his own. It’s René who carries the road book around his neck. Everybody seems to benefit from this new organization. Serge no longer has to worry about the route, he has company and the followers are more serene. I even manage to sleep between feedings. If there is a problem we can communicate via cell phone... when there is a connection! The last chapter is always the same, Serge finds his form. The weather is good, the temperature is lower, he can’t enjoy the scenery but in the calm of the evening, the sound of crickets and other night noises delights us all. We end the stage in a place called “le Varrat” at km 432.7. Once again Serge has run 102.5km. click to enlarge Happy he who like Ulysses has made a great journey…..
We reach Anjou where Serge hopes to find the sweetness mentioned in Du Bellay’s poem but the day will not be easy. The morning starts well. It's 7:00 a.m. when we cross the Loire at Chalonnes sur Loire. A surprise awaits us! A lady offers a slice of homemade apple pie to all the runners. 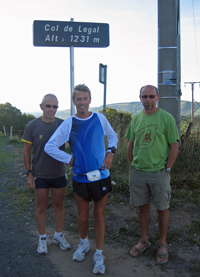 At 8:00 a.m. sharp, exactly 48 hours after the starting whistle at Saint Malo, Serge clocks 237 km. He is enjoying the new scenery on the Angevine corniche, between the river and the vineyards of Layon. I’m in my element because I live near Angers. We are in the region of the great Layon vintages “Chaume, Quart de Chaume, Bonnezeaux). A few friends come to see us: Thierry as we leave Chalonnes, Eliane and her little girls, then Patricia and Mylène. All these encounters are refreshing in this oven. Racing conditions are more difficult than this morning. Added to the stifling heat we find straight roads and heavy traffic. After Doué and until Loudun it’s Hell for us followers too. It’s very hard to feed Serge in such conditions. He is struggling at the end of the afternoon and decides to take an earlier evening break at Vaon, 77 km after leaving Saint Georges. He has a light case of diarrhea, which is never welcome when it’s very hot and we are on the lookout for dehydration which can occur at any time. After a light meal and a half hour rest he takes off again. I must admit that it takes a good morale and strong will to take to the road because the temperature has not gone down at all and the day’s fatigue has set in. After a short night, the alarm reminds us that we have an objective to meet. Serge is feeling the effects of yesterday and he shows signs of slight anxiety. He wants to take advantage of the early morning coolness. At 6:22 a.m. his running shoes on, he is on the road, walking at first to warm his muscles. Quickly jogging replaces walking and the machine takes off. 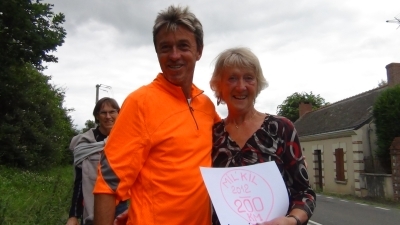 There are still a few kilometers to run in Brittany before we enter the Mayenne department for some 30 kilometers. The route will be rather flat until we cross the Loire River. We will be on a straight road with heavy traffic and we must be vigilant. By the end of the first day of the race gaps have formed and we no longer see the other runners, which now number 18 due to one withdrawal. At the break for lunch the first marathon has been run. Serge is concentrating on his race and in spite of a short night doesn’t want to rest. As soon as he drinks his coffee he takes off. The sun has come up and we are experiencing temperatures between the Norman coolness reported by Laure and the heat wave in Lyon we have heard about from René’s wife, Michèle. Because of the temperature we have increased feedings, more to prevent dehydration than for food. To break the monotony of this long straight road and the heavy traffic Serge is listening to his MP3. In mid afternoon we leave Mayenne and enter the department of Le Maine et Loire. We pass kilometer 200 at 6:00 p.m. at Marans (photo attached). After running 80 km Serge allows himself a half hour rest and a brief siesta following the evening meal. He starts again at 8:30 p.m. The temperature is lower and the traffic lighter which makes running more pleasant. 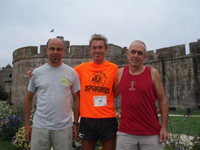 He runs 20 km more before stopping to sleep at Saint Georges sur Loire. Distance run = 102 km. visible on the faces of the runners and their followers as well. race begins at the foot of the ramparts. All the runners take off with relief. Serge’s start is calm and careful. conversation - the race has begun. earned rest until 6:00 a.m. tomorrow. 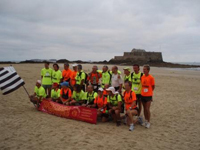 All the teams « runners and followers » met at Saint Jouan des Guérets, several kilometers from Saint Malo to take care of all the necessary formalities. Before the traditional briefing a buffet had been organized which enabled the groups to socialize. During the briefing, we were reminded of the safety instructions, we skimmed the road book to highlight certain points and we grappled with the different timekeeping and control procedures. We all listened attentively to what was said in this group of athletes whose victories speak for themselves. The followers, for those runners who are accompanied, didn't miss a word, for they have a very important rôle to play in this event. Serge is accompanied by René Girard, his young cousin, and me. The famous « Dupont » of the Paris-Tokyo are back. Serge was calm, relaxed and attentive to everything being said. After this meeting, we went to the hotel to finalize our action plan for the coming days. Tomorrow will be intense, because we will pass by the Mont Saint Michel on the August 15th weekend. On this first day we will be able to fine-tune our feeding schedule and see how we will divide the day between breaks, meals and race. Serge's objective: Run 100 km every day, keeping in mind that this is training for the Around Europe Footrace which will begin in 2 months. He can't risk an injury here. This evening in spite of a truly magnificent sunset and advice from friends to walk around the ramparts of Saint Malo, we did not linger. We need a good night's sleep before the start of this adventure because we all know that for the next ten days we will not sleep much in our camper, which we won't leave until we reach Sète. Tomorrow, Sunday, we are to meet at 7:30 AM at the starting line for a departure at 8:00 AM. Here is some information concerning the route that Serge will follow because many of you have asked us when and where he will run in your region and if you can run with him. In response to the questions: Where and When? The second part will begin mid-January 2010 with the first city stage in Toulouse January 16 in order to reach Nice by the end of January before going into Italy. 3 French regions will be crossed: Midi-Pyrénées, Languedoc-Roussillon and Provence-Alpes-Côtes d'Azur. The third and last French portion, which will close the Run Around the European union, will see Serge come through the Channel Tunnel at the beginning of September 2010 and will last 6 weeks, covering: Nord-Pas de Calais, Picardy, Champagne Ardennes, Lorraine, Alsace, Franche-Comté, Rhone-Alpes, Auvergne, Centre, Burgundy, Ile de France. And to answer your last question: Serge hopes you will come for a short run with him when he is in your region.